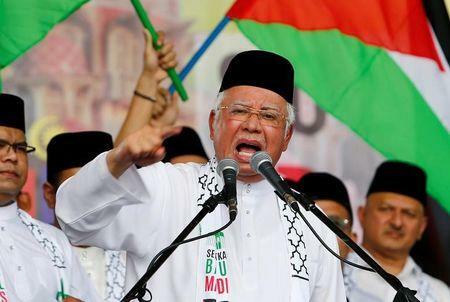 KUALA LUMPUR (Reuters) - Malaysian Prime Minister Najib Razak's scandal-haunted government pushed plans for legislation outlawing "fake news" on Monday as parliament convened for the last time before an election due by August. During the coming election campaign, Najib's foes are expected to fan suspicions of corruption over billions of dollars that have gone missing from 1Malaysia Development Berhad (1MDB), the state fund founded by the prime minister, and whose advisory board he had chaired until mid-2016. Malaysia's King, Sultan Muhammad V, told parliament at the opening sitting on Monday that he "greatly supported" the government's efforts to introduce a law to deal with "the spread of fake news and lies on social media". "Currently social media is very influential in forming the values and culture of a society," the King said in a traditional royal address at the opening of parliament. The final draft of the bill is expected to be presented for cabinet approval "in a couple of weeks time" before being tabled in parliament, state rub Bernama news agency quoted Azalina Othman Said, the minister in charge of law and parliament, as saying. However, Azalina said cabinet will consider if there would be enough time to table the bill in the month-long parliamentary meeting, which would predominantly debate the King's address. First exposed in 2015 by foreign media and news blogs, the 1MDB scandal has refused to die down despite Najib's consistent denials of any wrongdoing and his government's firm grip on the mainstream media in the country. At least six countries are investigating transactions related to 1MDB, including the United States, where the Department of Justice has mounted its biggest investigation under an anti-kleptocracy initiative, and has launched civil cases to recover assets linked to the fund. But the government has cowed independent media inside the country. In the early stages of the 1MDB saga, the authorities suspended one newspaper, The Edge, and blocked other websites for publishing stories critical of Najib's role, including widely read local news website The Malaysian Insider, which was later closed due to lack of funds. Governments elsewhere in Southeast Asia, including Singapore and the Philippines, have proposed laws aimed at clamping down on the spread of 'fake news', while media rights advocates have decried the trend in the region. Opposition lawmakers questioned the need for such a law in Malaysia, arguing that the government already had broad powers. "There are many other laws that are already in existence which can deal with these issues, so the only reason for a new law to come in is to make the severity (of punishments) even higher," said Tony Pua, a member of parliament from the Democratic Action Party (DAP). Abdul Rahman Dahlan, minister in charge of economic planning, said the bill could be broad enough to cover anything that could potentially damage the country. "Even spreading (bad) news about the economy is bad. (Fake news would be) anything that is not substantive, and dangerous to the economy and security of the nation," Abdul Rahman told Reuters outside parliament. (This version of the story corrects paragraph nine to say The Malaysian Insider closed down due to lack of funds).